Iain Gethin of Industore explains how it worked for jeweller Argento. Multiple retailer Argento was faced with a costly dilema when rapid expansion called for a relocation of its distribution HQ, but, as Industore group marketing executive Iain Gethin explains, the adoption of a new stock control system helped it to stay put as well as streamlining stock piling. When we talk about retail growth, we often focus on a bottom line statistic; units sold, stores opened, increase in margins and so on. What we don’t often discuss are the factors that facilitated that growth behind the scenes. At Industore we have played a crucial role in facilitating growth for a number of companies through the implementation of our automated storage systems. We are almost always sought to solve a floorspace or storage issue — a company is expanding and they need more storage space but at the same time they don’t want to perform an expensive relocation to new premises. One such company that approached us for this very reason was leading fashion jewellery retailer Argento. 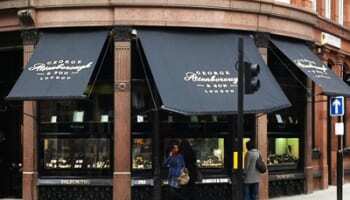 Since Argento opened its first store in 1997 the company has experienced continuous growth and now there are now 40 retail stores throughout the UK and Ireland stocking own-brand silver jewellery as well as jewellery and watches from brands including Pandora, Thomas Sabo, Daisy, Hot Diamonds and Trollbeads. Much of Argento’s success is attributed to its global sourcing network, which focuses on uncovering high quality, diverse pieces that it can send to retail. This global sourcing activity means that Argento consistently holds a large amount of stock at its Belfast distribution headquarters. It was in mid-2010 when Argento experienced a growth in the number of retail outlets that led to new challenges beginning to surface for them; more outlets meant more stock, which meant more space was required, space that Argento managing director Mel Boyle says wasn’t available. 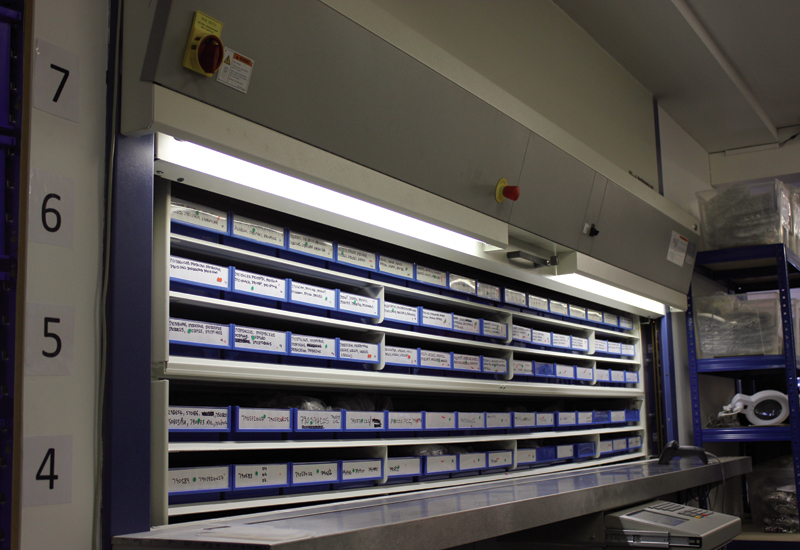 “Before Industore installed the vertical carousel we used to store all of our stock in a traditional pallet racking system,” explains Boyle. “As we grew we were requiring more and more space, so in order to cope with that increased demand for space we were specifically looking for a solution that was going to fit into our existing premises as we are very limited for space on this site. As an alternative to moving, we installed a 5m-high Hänel Rotomat which is now mainly used to store Argento’s two biggest brands, Pandora and Thomas Sabo. The Rotomat currently stores roughly £1 million-worth of stock, however one box within the Rotomat could retail for £10,000 on its own. 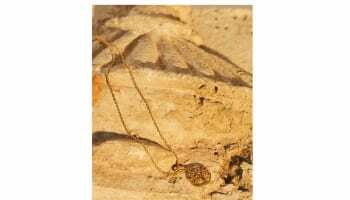 High-value stock such as this is common in the jewellery industry and the need to secure it correctly is another reason that makes this solution so useful. Each Rotomat, aside from lockable sliding doors, is set-up with a secure access system that can be used to restrict access for individual users and to individual shelves within the Rotomat. These two layers of security, in addition to the solid-steel build, make it a formidable storage solution to would-be thieves. Aside from the obvious benefits to storage space and security, we were quick to point out three additional potential benefits to Argento. Three factors that could make a huge difference to its overall operations: the potential to streamline stock holding, the potential to increase picking speed and the potential to increase accuracy. One of Argento’s secondary objectives when tackling its storage challenge was to address the size of the stock that it carried. Instead of money being held up in stock, it wanted to become more efficient and reduce the total cost of stock held in order to use its cash flow to continue expansion of its retail outlets. The process to use the Rotomat in improving picking speed and accuracy is actually immensely straight forward. Initially Argento integrated its warehouse EPOS directly into the Rotomat, which generated individual pick lists for workers. The only initial issue was that the lists being generated were for each shop; so there was one for Edinburgh with all the stock needed, one for Glasgow with all the required stock and so on, for 40 shops. This was still too time consuming. What needed to happen was for this process to be reversed, working backwards from stock to shop. Adjusting the process to pick 50 of one item, then sending three to Edinburgh, 12 to Glasgow, and so on, in order to speed up the order picking process. Argento’s EPOS provider wasn’t set up to perform the process that way around, so we helped Argento tailor the specialist MPX Software to integrate its EPOS Software and the Rotomat to do exactly what it wanted. The implementation of MPX with Argento’s EPOS to the Rotomat systems means that the system now essentially performs like this: the software will tell the worker the overall quantity of an item that is needed for all the stores; once fetched, the worker confirms the exact amount – including any shortfalls – that has been picked with the system; they then take the order to an area with a strip of light-buttons and individual buckets that are assigned to the shops; the software will then light up to show the number of items needed in each bucket; and once the worker has put the required amount in the buckets the light-buttons are pressed and the process repeats for a new item. Mel Boyle describes how the system has improved overall organisation and efficiency, pointing out a key example: “Our best day so far was around Christmas time. We were in from 8am to 8pm, now obviously we weren’t picking for that whole time, but we managed to pick 13,000 items. I’d say that since the implementation of the vertical carousel we are easily doing things three or four times faster than we were previously. As with any system, it is still open to human error, but there are multiple stages to check quantities and ensure accuracy. If there are any items left over, Argento can now immediately pinpoint where an error has occurred and swiftly correct it. So all in all, working with Argento has proven to be a very successful venture for Industore. Our solution has helped the retailer to streamline processes in addition to helping it gain the extra space it initially sought out. These improvements have in turn helped to aid the business’s continued retail growth and help maintain impressive bottom line statistics. This article was taken from the August 2012 issue of Professional Jeweller magazine. To see a digital version of the issue click here.